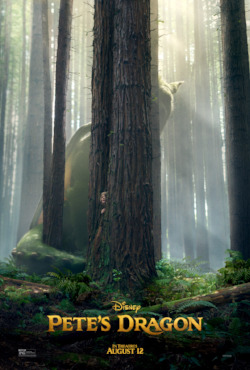 MOVIE SYNOPSIS: This remake of Disney's 1977 classic family movie follows a young orphan named Pete, who meets a very special dragon in the forest. MOVIE REVIEW: There's something wonderful about a movie that includes NO cell phones or devices of any kind. That's the first thing that sprung to mind while watching "Pete's Dragon," a remake of the classic 1977 Disney film. I think it's one of the reasons why Netflix's "Stranger Things" is such a huge hit. People yearn for a time when kids rode their bikes everywhere and weren't stuck inside playing video games all the time. The second thing that sprang to mind is that "Pete's Dragon" is a really beautiful movie. Remakes don't always hit the mark, but this one does. The story begins with Mr. Meacham (Robert Redford) telling a group of kids a story about a dragon who lives in the nearby forest. His daughter, Grace (Bryce Dallas Howard), is a forest ranger who doesn't believe a word of it. SHE's never seen the dragon, and she knows that woods like the back of her hand. Then Grace meets Pete (Oakes Fegley), a 10-year-old orphan who says he's been living in the woods for years -- with a green dragon named Elliot. Grace takes him home, but with loggers threatening to chop down the wilderness, Pete is determined to get back to the woods to help Elliot. "Pete's Dragon" is one of those rare family movies that both kids and grownups will love. Parents will love the sweet and wholesome story, and kids will find Pete and his loveable dragon enchanting. While the original film portrayed Elliot as an animated character, this remake is all live action, with Elliot a CG (computer generated) character. As mentioned, there are no cell phones or Internet, because like the original film, the story is set in the 1970s, when life was slower and less complicated. As with most Disney movies, there's a missing parent. In this case, two missing parents, which lead to Pete being orphaned. Young Oakes Fegley delivers a fine performance as Pete. You may recognize him as Gabriel Hayward on "Person of Interest" or young Elias Thompson on "Boardwalk Empire." Redford is charming as a grandfather who still believes in magic, and Howard is great as a dedicated forest ranger. Good casting all around. Along with the enchanting story, "Pete's Dragon" also has an important underlying message about taking care of your family, both biological and otherwise, and the wilderness as something to be protected and cherished. PARENT OVERVIEW: While wholesome and entertaining, "Pete's Dragon" contains plenty of peril and danger, along with some sad moments. Young Pete is only five years old when he's in a horrible car accident that leaves him orphaned and abandoned in the woods. Loveable dragon Elliot cares for Pete for many years, until loggers threaten their wilderness homeland. A gun is pointed at Elliot at one point, and it appears that he's died. There are a few mildly crude jokes, but for the most part, this is a sweet film about love and friendship, with themes of courage, family and teamwork. Violence/Gore: This movie includes frequent peril and danger throughout, with some sad moments. Young Pete's parents are killed in a car accident, and he's left alone in the dark woods until a dragon named Elliot protects him. Loggers hunt for Elliot, point a gun at him, shoot him with a tranquilizer gun and capture him. At one point, it appears that Elliot is dead. A daring chase scene ensues, and Elliot breathes fire at a bridge, causing it to crack and put people in danger. A car goes off the bridge, and it appears that people have died.